Gastroliths are defined as ‘Highly polished, rounded stones or pebbles from the stomach of some fossil vertebrates, esp. reptiles.’1 They are thought to have been used for grinding food. Stones usually believed to be gastroliths are commonly found in the Morrison Formation, which is believed to outcrop over one million km2 from southern Alberta and Saskatchewan, Canada, south to New Mexico, USA.2,3 The Morrison Formation is famous for its dinosaur fossils, especially the large sauropod dinosaurs. Figure 1. Outcrop of quartzite gravel about 20 km east of Moran Junction. Note that the quartzites have pressure solution marks and percussion marks, and are polished and fractured. While on a field trip in Wyoming, I found several of these stones in the Morrison Formation after looking for only an hour. If I can find several after a quick search, there must be billions of these so-called ‘gastroliths’ in the ‘late Jurassic’ Morrison Formation. Since few gastroliths are associated with dinosaur bones, the Flood would have had to pulverize tens of millions of dinosaurs just in the Morrison Formation to account for so many gastroliths, if that is what they are. How could such a feat be accomplished in a short period of time within the Flood? At the time, I did not have an answer to this ‘gastroliths’ problem. This ‘Lower Cretaceous’ formation actually was part of the ‘late Jurassic’ Morrison Formation but was reassigned to the above formation.7 Stokes did point out that there is much negative evidence against the dinosaurian origin of all these stones and that there were a number of skeptics. 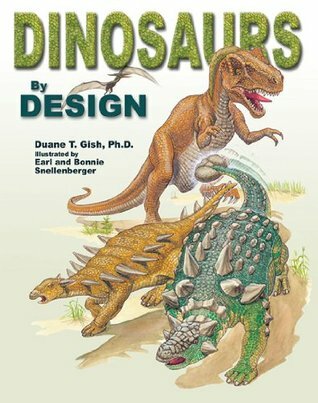 Two reasons for skepticism are the huge number of stones and the rare association of gastroliths with dinosaur skeletons. Moreover, stream and wind polished stones, which can be common in sedimentary deposits, look similar to gastroliths.8 A study of gastroliths in modern birds has shown that sandstone rocks quickly crumble in the birds’ gizzards, and that limestone lumps dissolve after just a couple of days.9 Rose quartz and granite stones disintegrated more slowly. None of the stones retrieved from ostrich gizzards were highly polished, such as the stones found in the Morrison Formation and others. So, the data on real gastroliths does not line up with the abundance of stones found in the Morrison Formation. The authors suggest that their results for the Cloverly Formation also may have implications for other formations with presumed gastroliths, including the Morrison Formation just below the Cloverly Formation. 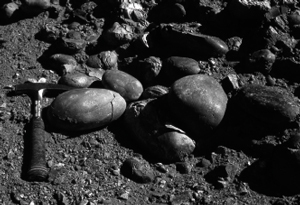 If the billions of rounded rocks in the Morrison Formation, as well as the Cloverly Formation, are not gastroliths, the time problem for the Flood evaporates. (figure 1). Quartzites make up 38% of the ‘gastroliths’ in the Cloverly Formation. After rounding, the quartzites could have been entrained with much fine sediment as a matrix-supported mass flow by the time the quartzites and other lithologies were deposited much farther east. I am disappointed, however, that the ‘gastroliths’ I collected likely are not real gizzard stones from dinosaurs. Bates, R.L. and Jackson, J.A. (eds.v), Dictionary of Geological Terms, 3rd Ed., Anchor Press/Doubleday, Garden City, NY, p. 202, 1984. Return to text. Turner, C.E. and Peterson, F., Reconstruction of the Upper Jurassic Morrison Formation extinct ecosystem—a synthesis, Sedimentary Geology 167:309–355, 2004. Return to text. Dodson, P., Behrensmeyer, A.K., Bakker, R.T. and McIntosh, J.S., Taphonomy and paleoecology of the dinosaur beds of the Jurassic Morrison Formation, Paleobiology 6(2):208–232, 1980. Return to text. Oard, M.J., Polar dinosaurs and the Genesis Flood, Creation Research Society Quarterly 32:47–56, 1995. Return to text. Oard, M.J., Newly discovered dinosaur megatracksites support Flood model, Journal of Creation 16(3):5–7, 2002. Return to text. Garner, P., Robinson, S., Garton, M. and Tyler, D., Comments on Polar Dinosaurs and the Genesis Flood, Creation Research Society Quarterly 32(4), p. 234, 1996. Return to text. Stokes, W.L., Dinosaur gastroliths revisited, Journal of Paleontology 61(6):1,242–1,246, 1987. Return to text. Dorr, Jr., J.A., Wind-polished stones: Two similar sites, Papers of the Michigan Academy of Science, Arts, and Letters 60:265–273. Return to text. Perkins, S., Role of gastroliths in digestion questioned, Science News 164:286, 2003. Return to text. 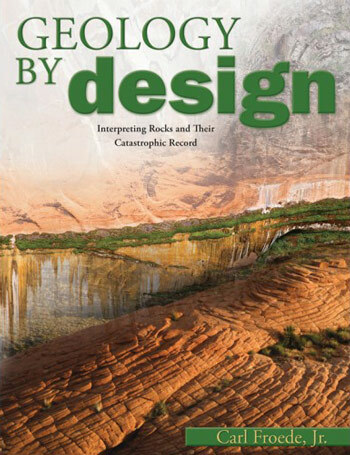 Zaleha, M.J. and Wiesemann, S.A., Hyperconcentrated flows and gastroliths: Sedimentology of diamictites and wackes of the Upper Cloverly Formation, Lower Cretaceous, Wyoming, U. S. A., Journal of Sedimentary Research 75(1):43–54, 2005. Return to text. Zaleha and Wiesemann, ref. 10, p. 48. Return to text. Zaleha and Wiesemann, ref. 10, p. 49. Return to text. Oard, M., Hergenrather, J. and Klevberg, P., Flood transported quartzites—east of the Rocky Mountains, Journal of Creation 19(3):76–90, 2005. Return to text.